Part of the Grupo Habita group of hotels, this is one of the hottest boutique hotels in town, attracting a stylish, savvy clientele whose tastes run toward fashion, culture, and design. 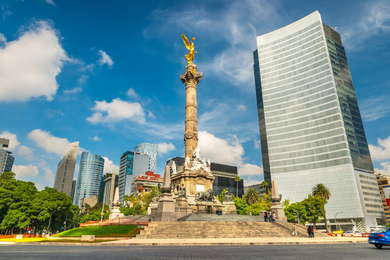 Located on the third floor of a former 17th-century manse, this hotel is perfectly situated in the heart of the center, just blocks from the Zócalo. Rooms retain the historic building's original soaring ceilings and stone walls while updating the interior with clean lines and contemporary Mexican design details. 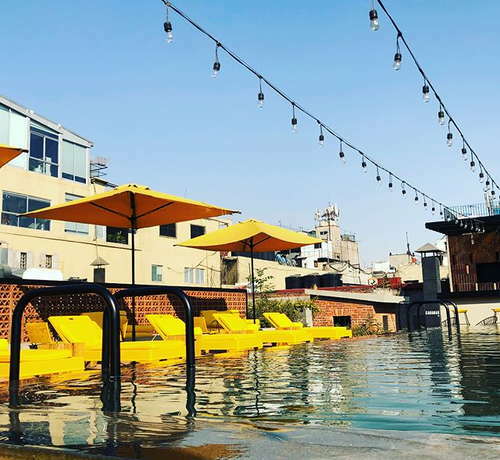 The building also houses a rooftop bar, pool, and hot tub, two well-regarded ground-floor restaurants, and a number of chic shops, not to mention a stunning living wall and a huge mural by Manuel Rodríguez Lozano painted in 1944-45. Options range from compact but comfortable colonial queens that feel larger thanks to the ridiculously high vaulted ceilings, to the 750 sq. ft. Revolution Suite, which has a lofted area that can be customized with an extra bed or work desk. Rooms are done in raw concrete with industrial lighting but feel cozy thanks to the handmade quality of the materials. YOU SHOULD KNOW Suites have balconies with street views, but queen and king rooms have no windows, just the large entrance doors that open to the courtyard. Bathrooms are seamlessly integrated into the room, so much so that there are no actual doors between the bathrooms and sleeping area, just screening and curtains. Amenities are from C.O. Bigelow Apothecaries. Check-in is in a discreet corner on the ground floor of the building; you then take an elevator to the third floor, where the hotel is situated. There, the lobby looks out to the tops of trees planted in the courtyard; it's a comfortable, quiet place to relax with a drink, in contrast to the more boisterous rooftop bar. Look for furnishings by mid-century Mexican designer Don Shoemaker. The outdoor rooftop pool is quite large, with an adjoining whirlpool, bar, and large sundeck. YOU SHOULD KNOW The pool is next to the rooftop lounge, which is open to the public; however, the lounge is generally quiet during daylight hours. There is no spa, although hotel staff can arrange outside services. While there's no hotel restaurant per se, two of the neighborhood's best restaurants--Azul Histórico and Puntarena--are located on the ground floor. Every month, Azul Histórico devotes part of their menu to food from a different region of Mexico, with recipes from guest chefs. The rooftop bar has views of historic downtown buildings such as Casino Español and Torre Latinoamerica. It's quiet during the day, becoming more clubby at night. The building also houses a branch of the popular mezcalería La Bótica. Smack in the center of the Centro, all the downtown sights are walkable, though you'll need to take a car to get out of the neighborhood. The Zócalo subway stop is two blocks away if you want to avoid rush-hour traffic. The grand, multi-story El Danubio (9-minute walk) is somewhere between a cantina and a fine-dining restaurant; the grilled langoustines are a must. Hostería de Santo Domingo (8-minute walk) claims to be the oldest continually operating restaurant in the city; their massive take on the iconic dish chile en nogada is on the menu year-round. Don't expect Cuervo and Corona at El Bósforo (12-minute walk), which focuses on tiny-production spirits and craft beer. La Barra del Patrón (11-minute walk) is a cocktail bar with an extensive mezcal selection and some interesting drinks; try the avocado sour. Discreetly chic and retaining all the splendor of the original 17th century building, and the perfect location if your agenda focuses on the historic center.